A number of occasions arise where you need to rip and convert DVDs to digital formats. Say you have a movie on DVD, but you want to watch it on your phone, tablet, somewhere else. Ripping a DVD movie to your hard drive on MacOS Sierra can seem complicated, but it's actually pretty simple. There are many programs out there that allow you to turn your DVD into a movie file on your computer - to play it wherever you want. Here we list three of the most popular free MacOS Sierra DVD Ripper software for you to choose the one which is the most suitable for you. Handbrake is an free and popular open source software application that is been widely used to rip DVDs and convert videos. It has myriad options and settings, but the developers have made it easy to use by setting up profiles for commonly used devices. Select your target device and HandBrake will re-optimize video format and settings for that system. With HandBrake running, insert a DVD and HandBrake will begin to analyze it. HandBrake will divide up the DVD by logical groups called Titles, each representing a different block of content on the DVD. Commercial DVDs, as I said at the outset, are encrypted. And if you try to rip them using HandBrake the first time, you'll get an error message that will give you the option of installing libdvdcss.pkg. Don't panic - there's no need to be alarmed. All HandBrake is trying to do is simplify the process of video conversion. Libdvdcss is a library developed by VideoLAN, the makers of VLC, a popular open-source video player. 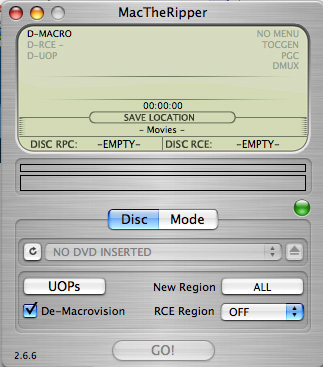 Libdvdcss works on most commercial DVDs. In their efforts to stop video piracy some major content publishers have complicated their encryption schemes in ways that libdvdcss won't be able to handle, though, so just be aware that this software has its limits. MakeMKV for Mac seems to be available as freeware, but its documentation states it is a beta version that will stop functioning after 60 days. it is your one-click solution to convert DVD that you own into free and patents-unencumbered MKV format that can be played everywhere.. So far I've tried to save you money by suggesting open source software to do your DVD decrypting and ripping. If you're not comfortable using open source software, there is paid commercial software that you can use instead. 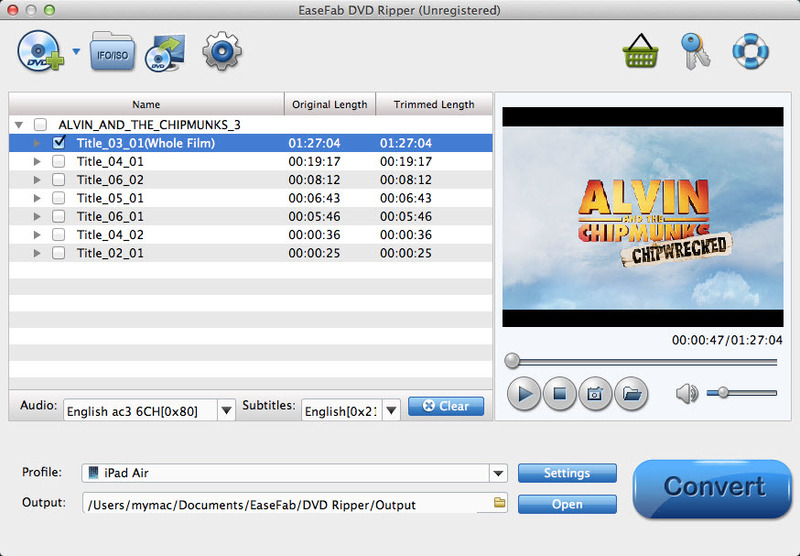 EaseFab DVD Ripper for MacOS Sierra is one such application. This fabulous DVD converter lets you convert any kinds of DVD without any barriers. It will helps you to remove all the restrictions of DVD, like CSS, Region, RCE, Sony ARccOS and PuppetLock. With it, you can rip DVDs to MKV, MP4, AVI, MOV, M4V, MPEG, H.264, etc. 200+ video formats with excellent output video quality, delivering 10x faster ripping speed than general DVD rippers in the market. The MacOS Sierra DVD Ripper software also provides optimized presets for 150+ multimedia devices. 2. Convert DVD to optimized format for enjoy the videos on mobile devices like iPad (iPad Pro), iPhone (iPhone 7, iPhone 6S Plus), Blackberry, Samsung and more. While the movie and television industry doesn't make it easy for you to build a digital library of movies and television shows you already own on DVD, technology is available to make the process easier. I wish it were a one-step process that was built into the OS, but alas, it isn't. Between HandBrake and the other options I've listed here, you'll be able to start importing DVD video into your Mac media library in no time. 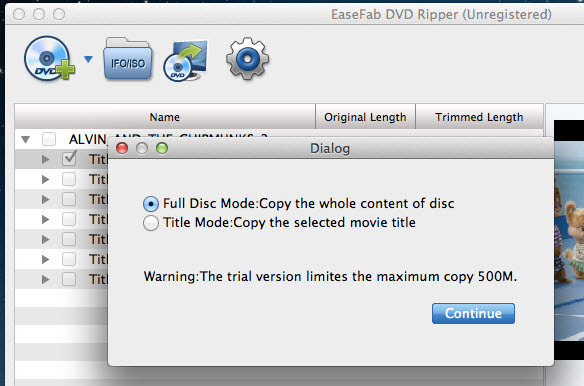 We have another tool entitled EaseFab LosslessCopy (macOS Mojave 10.14 compatible), which convers all the features of EaseFab DVD Ripper. The only difference is that LosslessCopy can help you convert video clips from proprietary encrypted DVD discs and Blu-ray to into MKV files with multiple video/audio tracks with all meta-information and preserve chapters. Additionally LosslessCopy can rip BD/DVD to MP4 and MOV with multiple audio streams.